It plays very well into the European consciousness to imagine that Rome fell because of a series of invasions by uncivilised and ignorant barbarians, jealously invading a land of enlightenment and prosperity, thereby extinguishing civilisation for a thousand years. And perhaps we cradle this belief because we feel the same thing is happening to us today. There is no shortage of people across the continent who would seek to pin European decline on invading hordes of Muslim 'barbarians', taking 'our jobs' and 'our women' and giving nothing in return but sharia law. That's certainly the sort of tripe you'll hear from the BNP in my patch for the Barnsley Central by-election, anyway. But the truth is that, just as Rome was not built in a day, it didn't fall so quickly either. 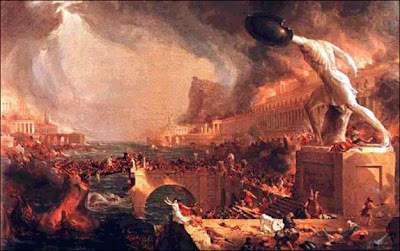 By AD 476 Roman society had already spent centuries destroying itself from the inside. One of the most easily recognisable signs of this was a steady erosion in the quality of the emperor's portrait on coinage. This begins from the fourth century and, by the beginning of the fifth century, the generic medieval blob style has already emerged. Again, the Renaissance is often depicted as a 'return' to a Roman level of civilisation, with portraits drawn in a realistic style for the first time in a millenium. But these skills had already disappeared and Rome was also haemorrhaging, too, knowledge in the fields of science, philosophy, arts and economics. A trend away from the laissez faire policies of the past to repeated debasement of the coinage, socialist prices and incomes policies and a strangling bureaucracy caused widespread poverty and hyperinflation. Cities were emptied as their citizens fled to the countryside seeking the protection of large landowners, thereby forming the beginnings of medieval feudalism. From this perspective, the final sacking of Ravella (Rome had ceased to be the capital in AD 286) and the deposition of the last western emperor Romulus Augustus in AD 476, was nothing more than the straw which broke the camel's back - that final piece of the Jenga puzzle that brings the whole tottering structure crashing into a heap of rubble. Of course Gibbon blamed Christian meekness, dogma and stubborn ignorance for this decline (also depicted in the highly recommendable film Agora). And through disastrous statist policies putting equality, redistribution and dumbing down above glory, prosperity and competition, the Romans of Late Antiquity had already gone a long way towards laying the foundations for medieval European society. This is evidenced by the fact that, even after 476, the eastern Roman Empire continued to evolve, uninterrupted, into a recognisable medieval state until the Ottoman conquest of 1453. And, even in the west, the historical record shows the Roman Senate continued to exist under barbarian kingdoms until at least 603 - there was no sudden break from enlightenment to dark ages. But what is frightening is that this dumbing down of society appears to be occurring in Britain today. And, most terrifying of all, it is doing so under a Conservative Prime Minister. I never bothered to renew my membership of the Conservative party after the election and would be ashamed to now hold it. By some insanity we have ended up with a Conservative government acting like Brezhnev apparatchiks in making open threats to boardrooms over the percentage of women that sit on them. A society that puts such a bizarre abstract concept above the right, and common sense, of private companies to make rational choices about who they see as the most qualified to lead them is headed for disaster. Lord Davies talks of 'a crisis in the boardroom of Britain.' What crisis? The only crisis I can see is that of a government completely disregarding its constitutional limitations. Even if, as Hay Group MD Lesley Wilkin says, 'a diverse leadership team is a more effective leadership team' surely that is for shareholders to decide? The government has no more moral or constitutional right to enforce this than it does, say, compulsory vitamin supplements or the banning of chocolate. They may or may not have a beneficial effect but both are entirely inappropriate fields for the government to be engaged in. At the same time, useless teachers are 'recycled' by frustrated heads giving good references to get rid of them, because workers' rights have now risen in our priorities above that of our children's education. Naturally, if this is allowed to continue, it will create a situation whereby the teaching stock gets worse and worse with each generation, in turn creating successive generations of children more feckless than the last. The not-unrelated matter of exams being dumbed down for political reasons is another deadly symptom of this decline in our civilisation. It is worth keeping in mind that the imperial Indian Civil Service, which had one of the most difficult entry exams in British history, was staffed by approximately 1,000 people running an entire subcontinent. And at it's peak, the Roman Empire only employed about 150. Uncompromisingly high standards are important to any society because they create the best kind of elitism - that from which no-one is barred but for which only the very best gain entry (either through examination, promotion, or off their own backs). Once standards drop - whether from fevered notions of equality or otherwise - that society's decline is guaranteed. And, as the 'dark ages' showed, that is bad news for absolutely everyone. 'Socialist prices and incomes'; 'strangling bureaucracy' - the looney left bring down the greatest Empire in history... hahaha! Then again only a Tory could condemn the BNP whilst simultaneously supporting a system that creates the best of all possible climates for the far-right to fester their poison in the first place.